A busy week left bulls sweating. How did the Stockcharters see it? My favorite artist by far is Vincent Van Gogh. It seems that there is a bit of an uproar in the art world these days concerning the alleged last painting of Dutch artist Vincent Van Gogh. Recently, a painting was discover among the possessions of a Greek resistance fighter, that has been attributed to Van Gogh. It is believed that this is the third painting, that Van Gogh made of his personal physician. Furthermore, it may have been his last painting just days before he went insane and committed suicide. The painting fell into the hands of the Nazis, after they stole it from a Jewish family during WWII. In 1941, when the Nazis moved into Greece, the painting was brought to Athens.The owner of the painting Doretta Peppa has sought out experts to confirm its authenticity. The portrait current resides in a bank vault in Athens. There are two other paintings of Dr. Gachet, which are identical. One of the portraits hangs in the Muse'e d'Orsay in Paris, the other painting of Dr. Gachet had been stolen by Hermann Goring during WWII, who sold it to an Amsterdam art dealer named Siegfried Kramarsky. After his death, the Kramarsky family had this other 'portrait of Doctor Gachet,' auctioned off at Christie's in 1990 for a staggering $82.5 million. Now should this third portrait of Dr. Gachet, prove to be an original and not a forgery, experts estimate its value to be in excess of $100 million dollars. This is the perfect allegory for what is taking place in the stock market at this time. In the first chart below, I have compiled three financial stocks together along with the financial and broker ETFs. Lehman Brothers (LEH) , Goldman Sachs (GS), Morgan Stanley (MS) will announce earnings next week. First, Lehman Brothers will announce on Monday, Goldman Sachs on Tuesday, followed by Morgan Stanley on Wednesday. Many of the financial stocks appear to be putting in a double bottom, including XLF. The technical picture in the financials looks promising, because each of those investment brokers got a bullish candlestick reversal last week. While GS and MS both got confirmations of their reversal patterns, LEH has not. 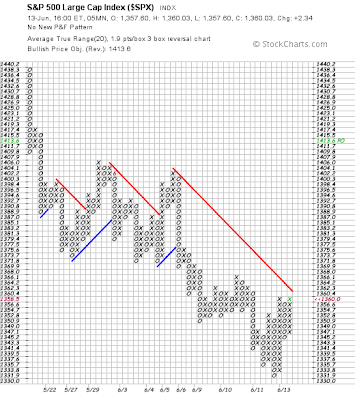 However, as of Friday it did complete a bullish Morning Star reversal pattern. It will likely be confirmed when LEH reports earnings on Monday. The market is either carving out a contratrend or it is putting in a floor, by setting up a double bottom in the financial sector. We won't know until prices hit major resistance. If the technical situation begins to improve, and we can prove the authenticity of this recovery, it may be priceless. 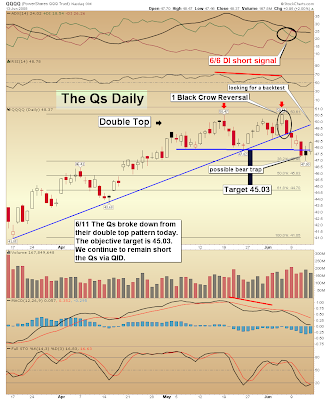 The QQQQ may have made a counterfeit move last Wednesday, when prices fell below the confirmation line of a double bottom. The QQQQs moved back above the horizontal trendline on Friday, and could be backtesting its recent broken intermediate trendline. But the knee jerk violation could also be a bear trap. We won't know until the dust settles after this current push higher. The Qs may put in a lower high or even a triple top pattern. On the other hand they could continue higher. The MACD histogram in the daily timeframe got a higher bar on Friday, changing the slope to up on the daily chart, while the stochastic hooked back up crossing slightly above the signal line on Friday. Last Thursday, I got the signal to take profits on my swing trade of QID, DXD, SDS (Pg 2), and go long on QQQQ and SPY. 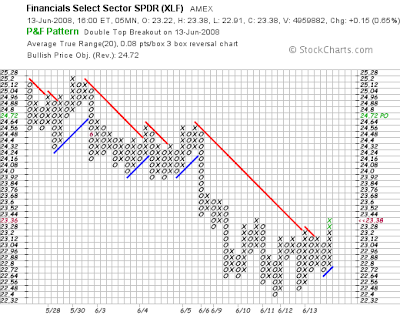 The Qs and SPY both had bullish falling wedges turned double bottom patterns. Those swing trade positions remain open. However, I still have some core position trades (50%) on QID, DXD, and SDS, and I'll hold them until my indicators tell me not too. Like other many traders, I swing trade (hold approximately 2-5 days) and position trade (hold for the duration of a trend) at the same time. If you do this you should have more than one brokage account. I got sell signals on the ultrashort swing trades, but have not gotten a sell signal on my longer term position trades on the daily charts. If I see evidence that the market is doing a complete 180, I will close those positions. But so far the S&P 500 remains below its 20-, 50-, 200-day SMAs, neither have we seen a bullish realignment of the moving average EMA trio. Additionally, the ADX and Aroon still indicate that the S&P 500 is in a downtrend. Meanwhile, the S&P's 500 weekly MACD histogram has a declining slope. That means the trend is still down for now, until things improve. Not only did we see the financials put in some reversal patterns, but the S&P 500 and the DJIA both got an inverted hammers last Thursday, which were confirmed during Friday's rally. But the reversal is on lighter volume. The intraday charts suggest that there is more upside, which is why I went long on my swing trade. In addition to the reversal candle patterns, the DJIA has exceeded its 61.8 Fib retracement, the S&P 500 came within just a few points of tagging its 61.8 Fib. While the Nasdaq and Qs bounced off their 38.2 retracement. Is the market recovering? It could be, but we won't know for sure until the recovery can be verified as authentic (the real deal), just as Van Gogh's painting. This market needs to be under extreme scrutiny, in order to determine if this reversal is legit ament or merely a contratrend headed back to test the declining trendlines of resistance. 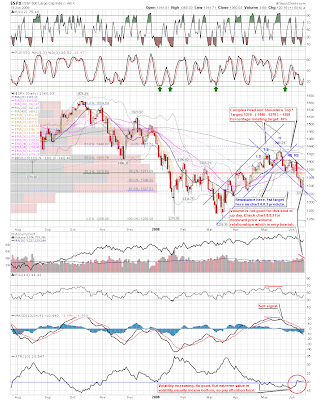 Crude oil (WTIC, 7th chart below) now has a divergence between price and the MACD and RSI. The histogram formed a bearish triple M (m-M-m) pattern on Friday, as the MACD line looks ready to curl over and roller coaster down below its signal line. Energy is unsustainable for the short term and may need a breather before attempting any kind of stability at these levels. I think the traders will gang up on crude in the near future. The retail sales for May came in better than expected at 1.0 %, proving that the stimulus package is working. But the relief rally came on Friday, when inflation came in worse than previously forecasted, at 0.6 % taking headline inflation to 4.2 % year over year. While core inflation came in at 0.2 %, with a total 2.3 % year over year. Despite historical energy prices inflation is behaving itself. The rally occurred because many were expecting inflation to come in much worse due to high energy costs. When it didn't, they felt safer about getting back into the water to get their feet wet. Even if inflation were to hopscotch higher, Mr. Bernanke still couldn't raise rates. With the economy growing below trend, he doesn't even have the luxury to raise rates if he wanted to. That would be just about the worse thing that he could do. Next weeks economic data will include building permits, housing starts, PPI inflation, and then the Conference Board's leading indicators. In memory of Tim Russert, an excellent political journalist. Happy fathers day! 6/14 -- The bottoms we hit this week look promising as short term bottoms, but the larger trends in both short and long term are mostly down. I redrew a number of charts to accommodate the lowest and highest points and the picture becomes much more tilted to the downside. So, enjoy this little countertrend rally, but remember where we really are in the bigger picture. 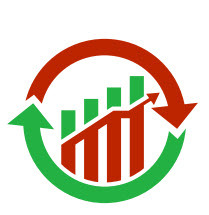 6/12 -- [There's some technical problem with a number of my charts, and I couldn't update them...sorry] People spending rebate checks are not going to change much about the economy I'm afraid, and half way through the day it seems everyone realized that. We are oversold enough to bounce at any time, but this market is likely heading lower for a while. 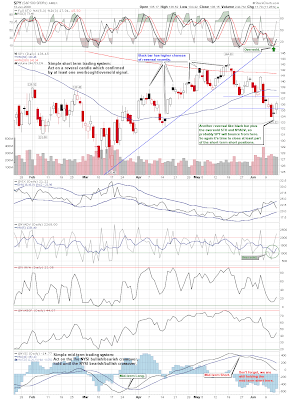 6/11 -- My intuition proved right as indexes accelerated downward slides today. The Techs (XLK) and Communications (XTC) stocks finally broke their uptrends on the hourlies that had been intact since March. The small caps plunged through the support of their sideways channels and the large caps just accelerated there declines. We may need a big washout and reversal to get this thing going upward again. 6/10 -- The short term charts are holding, but I can't help but get the feeling that more downside is on the way -- both from a chart perspective, market internals, and a gut feel that the news we haven't heard yet is getting worse instead of better. My sense from the Lehman brothers news is that we're simply being lied to about how bad things are behind the scenes. Bounces are anemic at best and are continually met with selling. I can't even imagine the kind of good news that would get things rolling again on the upside yet. Nevertheless, we are holding and could conceiveably bounce higher here though still in short term downtrends.